There are many Gatlinburg attractions available, and almost all of them are great for families of all ages. If you’re not fearful of heights, you’ll be interested in these particular attractions, not just because they provide quite the thrill, but for the simple fact that they give you more outstanding views of the Smokies. If you’re a bit afraid of heights, this would be a great time to face your fears and brave these 4 Gatlinburg attractions that take you high off the ground. The ​Aerial Tramway​ is for those who want to take the scenic route to Ober Gatlinburg from the Parkway. You can drive there, but taking the tram is one of the Gatlinburg attractions that offers unbelievable views of the Smokies. The tram regularly departs from the Tramway Mall on the Parkway, taking you on a 10 minute, 2.1 mile ride up Mt. Harrison. It’s well worth the admission to board this Gatlinburg staple that took guests on their first ride in 1973. Your fun won’t end with the ride, as Ober Gatlinburg is also a wonderful place full of fun activities for the family to enjoy! Anakeesta​ is one of the newest Gatlinburg attractions that’s unique, because you must face your fear head on. You can’t drive up, so that means you must take either the enclosed gondola that seats 6, or the open-air chairlift. This 12-15 minute ride has great views, but at the top, you’ll have picturesque 360-degree views of the beautiful Smoky Mountains and downtown Gatlinburg. It’s also one of the best places to see a sunset. They’re still working on new and exciting things, so take a visit to this little village in the mountains. 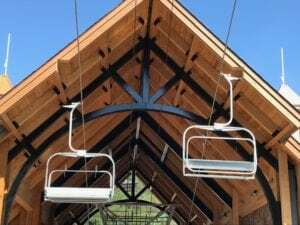 The ​Gatlinburg Sky Lift​ is one of the iconic Gatlinburg attractions that’s still going strong after decades of delighting families with their spectacular views of the Smoky Mountains. Located less than a mile from us, the Sky Lift takes you up Crockett Mountain where you soon will be able to stop, shop, and take pictures of the beautiful views that greet you once again. Generations of guests have enjoyed taking this ride, and it will keep going, continuing the memories the Sky Lift gives guests. The ​Gatlinburg Space Needle​ has been one of the centerpiece Gatlinburg attractions since it opened. Visitors at the bottom love the arcade, but the views at the top provide so much more. The glass elevator takes you 400 feet up to the tower deck, giving you incredible views. Viewfinders at the top are there for you to see even more details of your stunning surroundings, which include the towering Mt. LeConte. Your ticket is good for 2 visits in a day, so you can view an awe-inspiring sunset and see a Gatlinburg downtown that sparkles in the night. A vacation in the Smokies will heighten your senses. These Gatlinburg attractions will put you well on your way toward reaching this state of vacation bliss. If you’re longing for a top-notch vacation, we can help you get there when you ​reserve a cabin rental​ with us at Smoky Mountain Chalet Rentals today!